We hoped that through better understanding these indicators, we could help all of our students turn their brilliant ideas into compelling, convincing written analysis. Thus began a humbling, yearlong process of tweaking and adapting our instruction until we arrived at an iteration where we actually began to successfully teach our students to analyze. 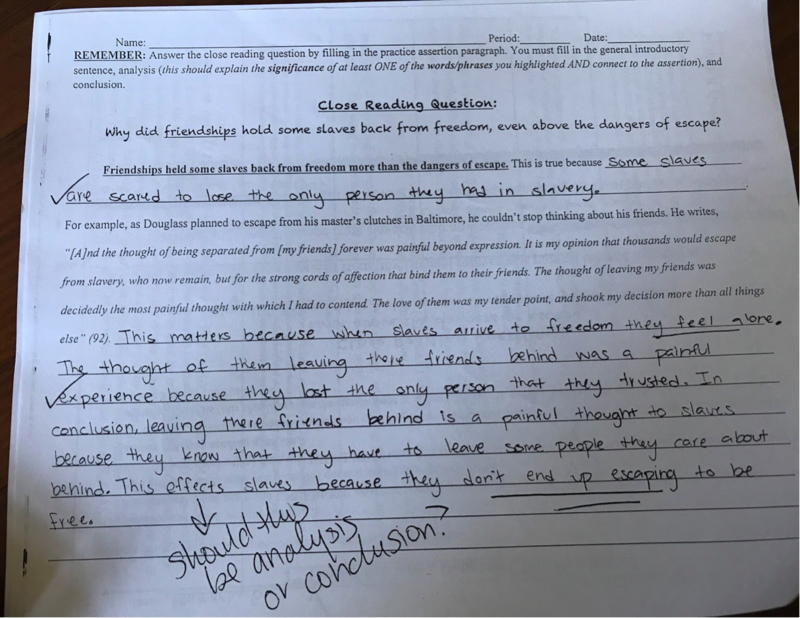 We soon learned that this adaptation was not enough for one of our focal students, Katrina, who wrote an assertion paragraph in response to the question: Why did friendships hold some slaves back from freedom, even above the dangers of escape? 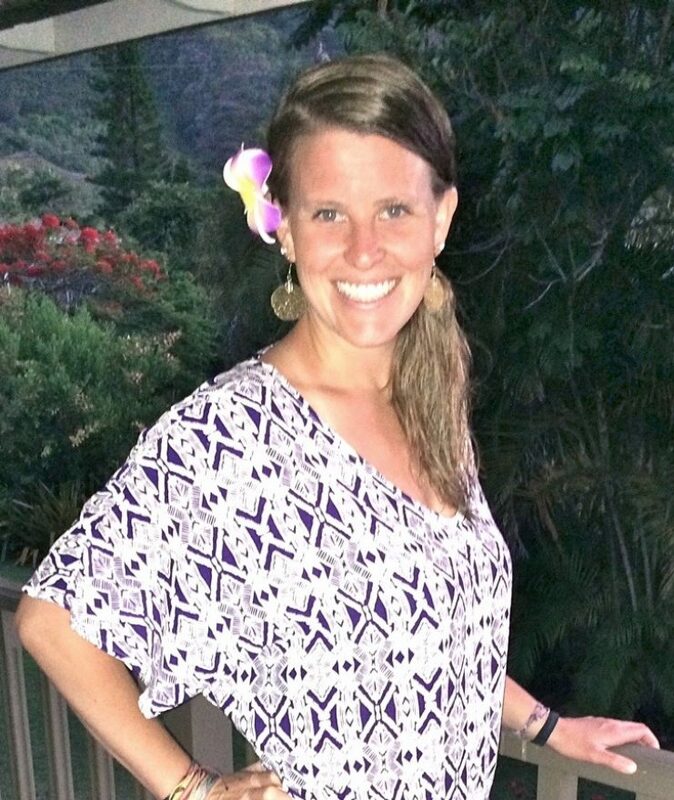 While Katrina expressed that some slaves ended up choosing friendships over the possibility of freedom, her paraphrase of the quote was stunted and some of her best thinking, where she really connected the quote to her claim, ended up in her conclusion. Also, Katrina’s high-leverage word, “painful,” was not as high-leverage as others and did not give her much to dissect and interpret. Choosing a phrase like “tender point” might have allowed her to go into more of the nuances around the tension of slaves who dismissed the thought of escape because of their friendships. In looking at Katrina’s and other focal students’ writing at this point in our inquiry, we realized that while giving students a claim helped them at least superficially interpret the quote, it did not help them latch onto key words or the quote’s deeper significance. My teaching partner and I were worried. This scaffold seemed to move Katrina further away from her goal of writing convincing analysis. First, Katrina’s summary of the quote is inaccurate. While Malala did mention that people are getting injured and killed, that understanding does not encompass the essence of what the quote is about. Second, Katrina’s definition of her high-leverage word, “rights,” is confusing. She uses her high-leverage word twice in her own interpretation, making it hard to know if she truly understands its meaning. Third, in the analysis section, Katrina does correctly identify that Malala is using emotional manipulation, but she not address the second part of the claim about Malala’s effectiveness or success in her use of that Tactic of Liberation. This instructional strategy did not help Katrina arrive at an accurate summary of the quote nor a relevant interpretation of her high-leverage word. 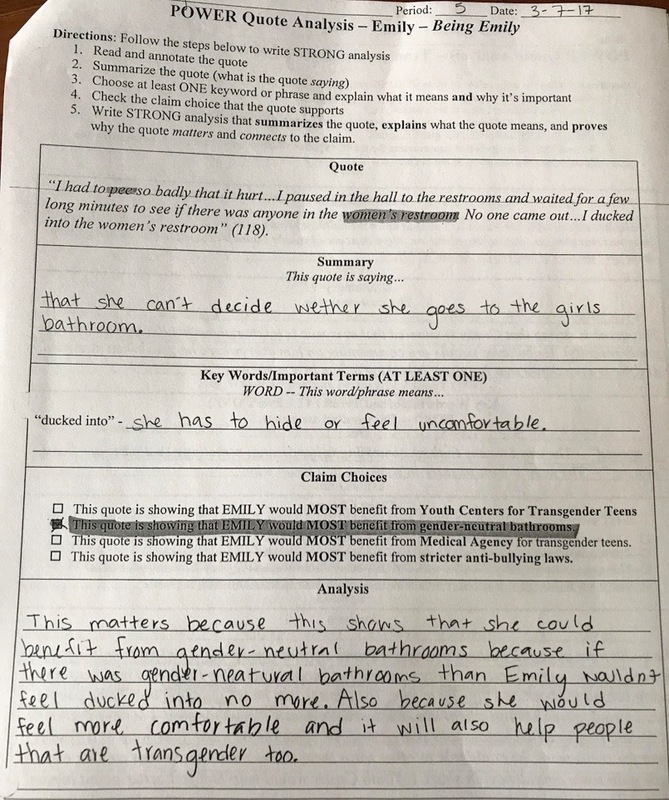 More problematic, this strategy did not help Katrina and other students see that all of these steps needed to be present in the analysis in order to fully prove their claims. What next? 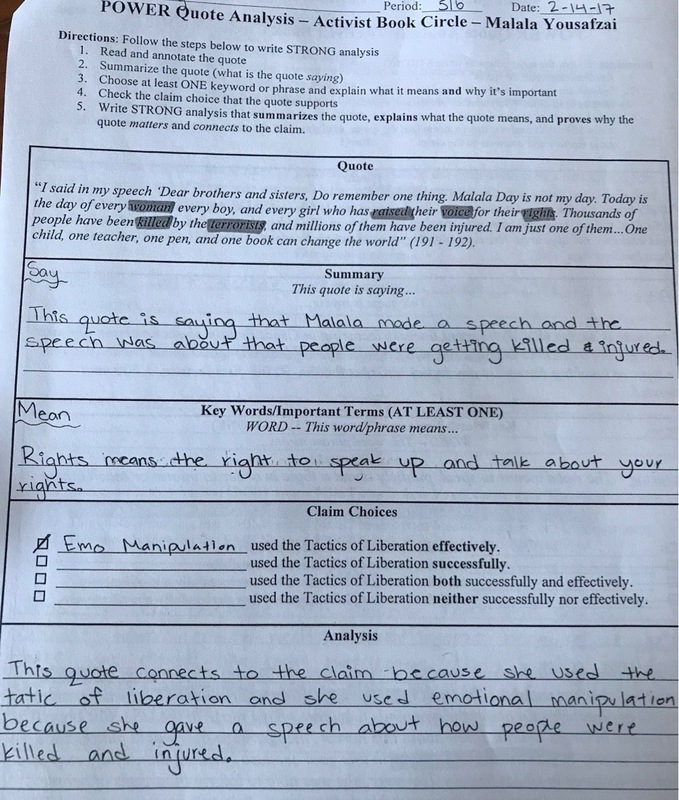 Although there seemed to be a lot of issues with v.1, my teaching partner and I chose to make one small change to the tool before abandoning it altogether: we gave students the high-leverage word or phrase that we believed would open up their access to the quote and enhance their analysis. We saw two important improvements in this iteration. To begin, while Katrina’s summary of the quote is still a little superficial, her definition of the high-leverage phrase “ducked into” enhances the summary because it speaks to the discomfort that the protagonist feels in the gender-specific restrooms. So, we believe that the opportunity to define that specific phrase boosted Katrina’s comprehension. Then, Katrina even uses the high-leverage phrase in her analysis to prove that her protagonist needs gender-neutral bathrooms to help her feel more comfortable. After this third instructional modification, we saw that providing students with high-leverage words and phrases not only boosts their comprehension of the quote – because they know that they should seek to understand that piece of the quote – but it also models the kinds of words and phrases that are “worthy” of interpretative work. My teaching partner continued to have students practice with v.2 while giving feedback on our fourth indicator of success (clear, traceable logic between steps). Happily, we continued to see more success, especially around meaningful interpretation of the high-leverage words and phrases. Here, notably, we see that Katrina’s definition of her high-leverage phrase is nuanced; she even offers three different possible interpretations that are all relevant and meaningful. Furthermore, she builds on those interpretations in her analysis in order to prove that her protagonist needs youth centers to not fall into “the depths of depression.” Finally, success! This was exactly the kind of analytical work that we wanted to see our students engage in. 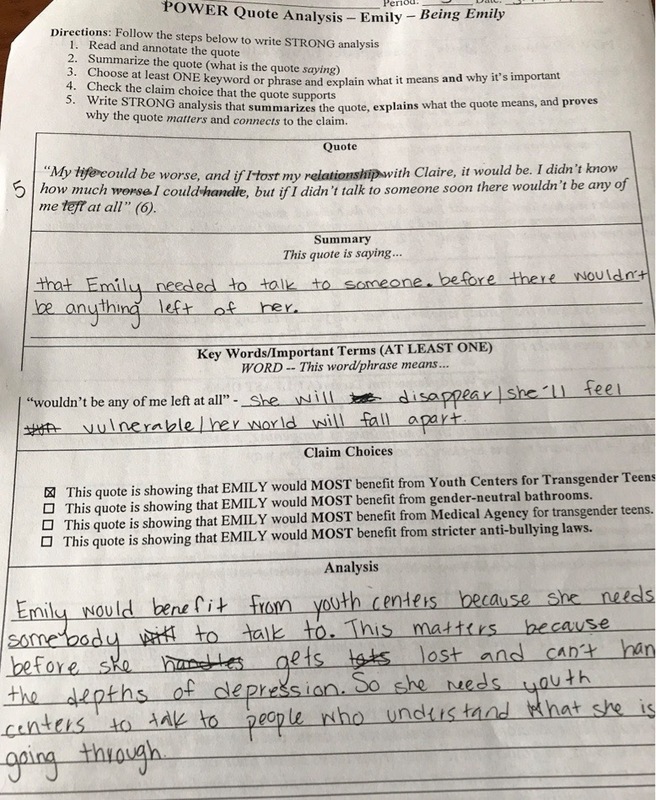 Through this inquiry, my teaching partner and I realized how much a comprehension breakdown around a chunk of text can impact a student’s ability to write analytically. To combat this problem, we wanted students who were reading below grade level to have access to tools that allowed them to unpack small chunks of text (i.e. quotes) in order to boost their analytical skills, while simultaneously working on their overall reading comprehension. We found that providing high-leverage words and phrases addressed both of these concerns. The strategy gave students the key to open up an important part of the quote and offer their own interpretation. While they may not fully comprehend the whole passage, they had something to write about in their analysis because they understood a crucial and relevant piece. In the upcoming school year, I hope to learn more about whether providing high-leverage words and phrases truly acts as effective modelling for students. By this I mean, by repeatedly encountering and evaluating the words and phrases that I pick, are my students empowered to find their own AND use them effectively in their analysis?